1. Take a few potatoes remove their skin and sprinkle some salt over them. 2. Pour 4-5 tbsp oil in a frying pan and cook the potatoes until tender. leaves, 2-3 tbsp sautéed onions , finely chopped green chilies and the cooked potatoes. 5. Add salt and black pepper as per the taste. Whisk them well together. 6. Take a frying pan pour just a tbsp of oil (preferably olive oil) and put in the batter. 7. Cook for about a minute. Cover it with a lid so that it does not remain raw for about 2-4 minutes and till it gets golden brown. 8. Turn it over so that the other side cooks as well. Cut, serve and enjoy!! 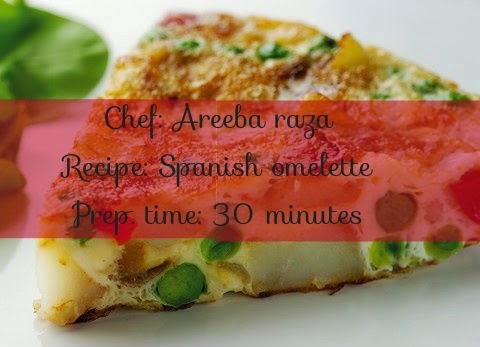 My husband likes Spanish omelette a lot that's why I often search for its recipe.Now I will make him a Spanish omelette by following your given recipe.